Talent Acquisitionists are constantly on the lookout for fresh Talent and untapped Sources to capture the needle in the hay stack Candidates. The practice is followed usually when they’ve exhausted all the current resources that pull up insufficient results. In such a scenario or when the resources they utilise aren’t providing the Talent they seek thus they are forced to find other platforms & job portals that have the Talent they require. Conduct X – Ray Searches using Boolean commands and enter the search strings created to receive a wide search results for Data Analytics Talent. 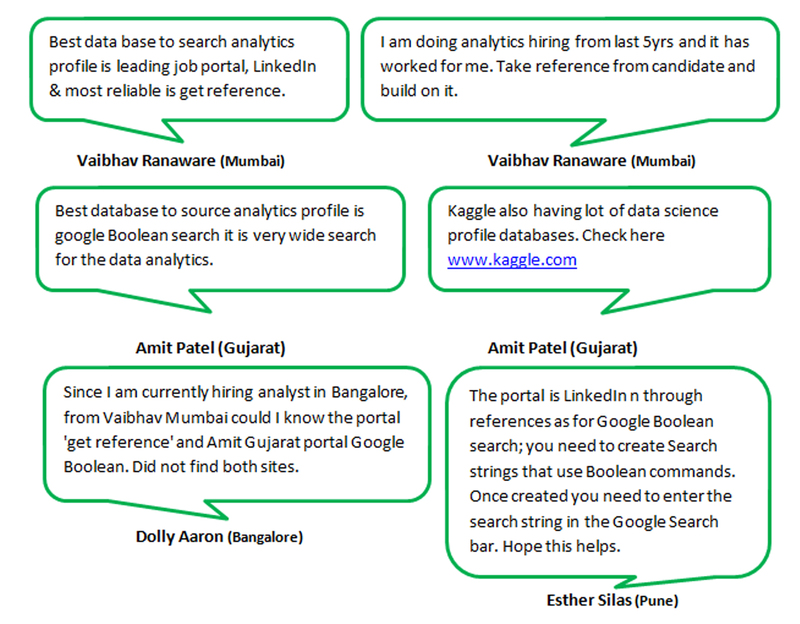 So there you have it the best portals and techniques to assist you in Sourcing for Analytic profiles. If you’ve read this far then you certainly realise the importance of being an Active learner rather than a Passive one. With your contact details and location and one of our representatives will get in touch with you. It’s that easy, wouldn’t you agree? Therefore avoid being a Passive learner instead be an Active one to add to your learning. Also you’ll remain updated with the current trends and practices that are followed and even resolve your queries by joining the WhatsApp groups. Here you’ll definitely get insights into topics like Ways to Scout PhD. Talent Holding Multiple Patents , including the full cycle of Recruitment and so much more. Big data has always been around but its relevance and importance has just surfaced due to the digital age. With that Social Media, Sourcing has gained momentum due to the amount of relevant information available online. Having said that it’s only obvious for companies to look for better tools and techniques to test Talent before on boarding them. There are several tools and techniques that Talent Acquisitionist’s can implement to speed up the Recruitment process. One such tool is a reliable Online IT Test for Recruitment that can assist you in the selection process. Finding best companies offering reliable Online IT Tests isn’t easy and we’re here to help you find what you’re looking for. Thanks to the group members we are able to provide assistants as the topic for the popular Wednesday discussions was on, “Online IT tests for Recruitment on two parameters i.e. 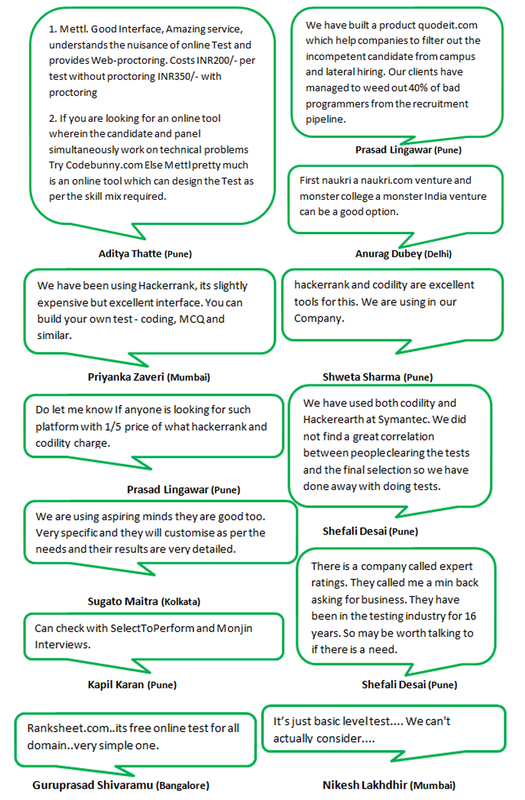 Which are the best companies offering online IT tests for Recruitment? Mettl is a good tool as it’s got a good Interface, amazing service, it understands the nuisance of online Test and provides Web-proctoring. You can use the Codebunny test when you want the candidate and panel to simultaneously work on technical problems. A naukri.com venture and Monster college i.e. a monster India venture are good options. Aspiring Minds is very specific and they will customise as per your needs and it gives you very detailed results. There is a company called expert ratings that have been in the testing industry for 16 years. So it’s worth talking to them if the need arises. com is a free online test that covers all domains and is a very simple one to conduct and gather information. 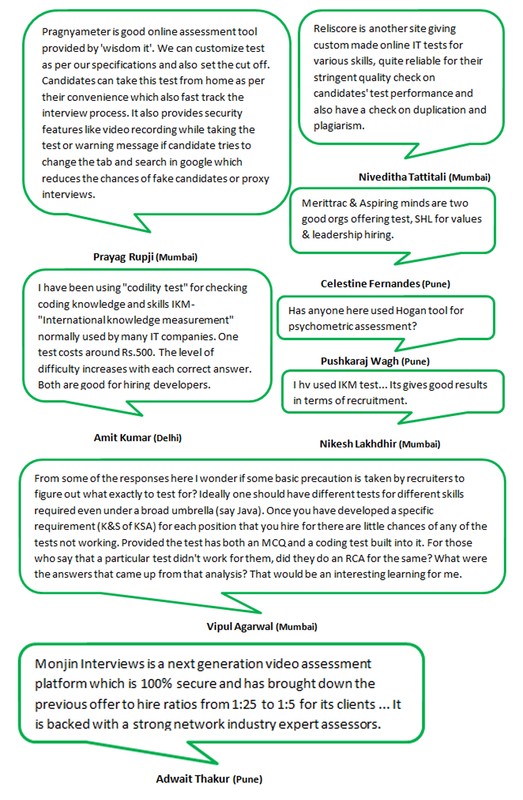 Pragnyameter is a good online assessment tool provided by ‘wisdom it’. Candidates have the flexibility to take this test from home up on their convenience which also fast tracks the interview process. It provides security features like video recording while taking the test or prompts a warning message if a candidate tries to change the tab and search in google which reduces the chances of fake candidates or proxy interviews conducted. The test is quite reliable due to the stringent quality check on a candidates’ test performance and it also checks duplication and prevents plagiarism. No correlation between people clearing the tests and the final selection were found hence some organisation have done away with doing tests. Monjin Interviews has brought down the previous offer to hire ratios from 1:25 to 1:5 for its clients. Clients who have used this tool have managed to weed out 40% of bad programmers from the recruitment pipeline because of this tool. Once you have developed a specific requirement (K & S of KSA) for each position you’re hiring for; there are little chances of the tests not working provided the test has both an MCQ and a coding test built into it. If a particular test didn’t work for you then you may need to do an RCA for the same and evaluate the answers that came up from the analysis. That would be interesting to learn as it might shed some light on the aspects that weren’t taken into consideration. That’s it for now nevertheless I’m sure you’ve got what you wanted if you’ve read this far. Now you know exactly what you’re missing out on, so don’t you agree that you need to be an active learner rather than a passive learner? Simply DM us @SourcingAdda with your details (Full Name & WhatsApp Contact No.) and our representative will get back to you. You’ll definitely learn something new and add to your knowledge by participating in these discussions, as you’ll get insights to the trending topics like Impact to the Naukri Monopoly due to Randstad buying Monster that the Talent Acquisition community currently faces. If eagerness is shown by the Recruiter a Candidate is likely to think that they are the only one eligible for the post thus they have a tendency to ask for the maximum hike. Recruiters shouldn’t push Candidates too hard to join as this enables them to re-negotiate better on aspects like CTC where Candidates are more inclined to join the organisation. Recruiters should showcase the opportunities that the Candidate gets at the Organisation by highlighting a good salary package and environment to work in. When negotiating; Recruiters should clarify expectations in the beginning when the profile is shared and both parties should be frequently reminded about it. Recruiters should be neutral when negotiating as it helps to understand the view of the Client or Candidate. Keep Candidates engaged at every stage right from immediate contact via phone to the interview up to joining and even post joining. Its human nature to be eager however, a Recruiter can be sure about the Candidates decision provided the same eagerness is replicated from the Candidates reaction. The Ans. to the question at hand is No, as it may result in you showing a Candidate that they are more inclined towards the CTC rather than the role offered. It is essential that Recruiters allow them to set their own expectations and help them to realise that they’re asking for a budget i.e. more than what they deserve. The negotiation stage is the crucial period because there are two types of negotiations that are held namely; poor and healthy negotiations. It is very important for a Recruiter to be in touch with their Candidates initially so that they can address any issues or challenges a Candidate is facing and help in resolving them which is an added benefit. Follow ups with candidates have to be done without irritating prospective Candidates; too much follow up isn’t good either. Even posing to ask them information about the subject of their expertise may help to maintain their interest which can result in them continuing to speak with the Recruiter which also builds a good rapport. 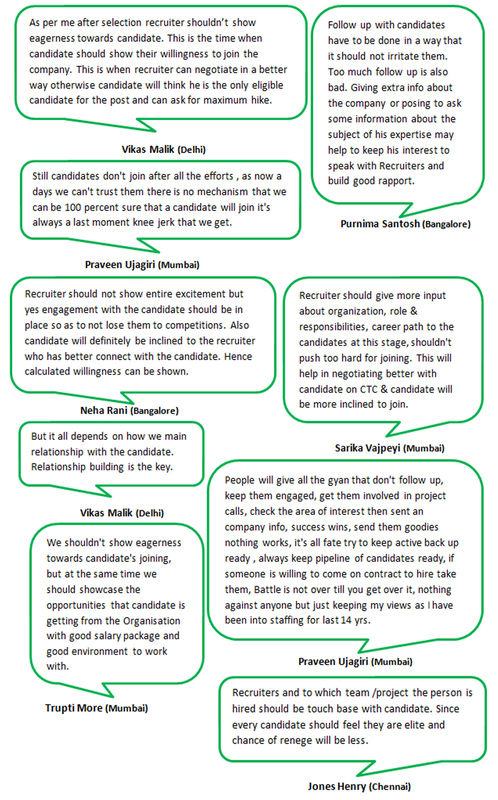 Candidates will definitely be inclined to a Recruiter who they have a better connection with hence; relationship building is the key. If nothing works; keep an active back up ready, always keep a pipeline of candidates ready, if someone is willing to come on contract to hire; take them, the battle is not over till they are on board. You need to know that you can’t trust them since there’s no mechanism that will give you a 100 percent surety that a Candidate will join. 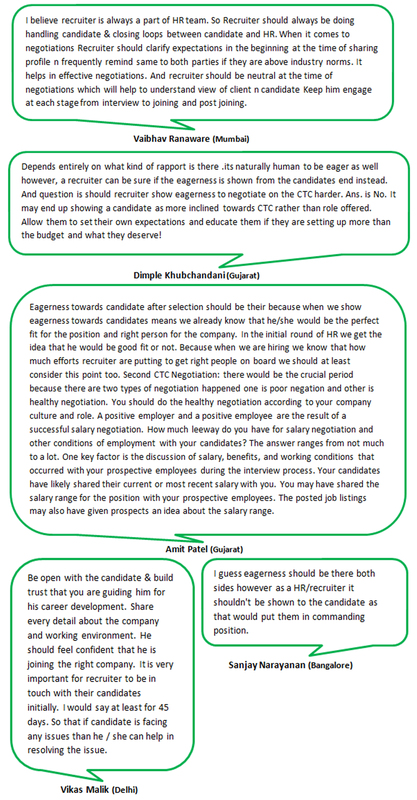 We’ve received an out pour of inputs where several perspectives and aspects were covered right from the obvious Recruiter perspective, a Candidates perspective to solutions that may work, facts that we most often forget or don’t realise. And if you’ve read this far you know what you’re missing out on. So why not join the group; become an active rather than a passive learner as you’ll get inputs covering topics like the Impact to the Naukri Monopoly due to Randstad buying Monster. To get real time updates to our upcoming events and activities you only need to follow us @SourcingAdda. You can be a part of the group by simply sending us a DM via Twitter @SourcingAdda or you can leave your requests to join the groups along with your views in our comments section.